It’s time for another free giveaway! …and I thought I should share. 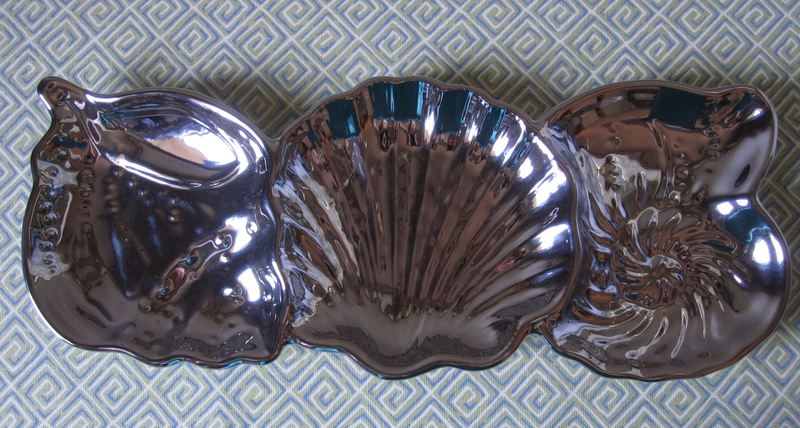 This silver painted ceramic dish features three sleek seashell profiles. It measures 15 inches long x 6 inches wide. It would look great on a coffee table, a dresser, or anywhere you want to add a little pop of beach style. Could you find a pretty place for this dish in your home? I bet you can! To Enter: Leave a comment that begins with “BEACH ME!” and tell me the name and location of the best beach you have ever visited. What made your beach wonderful? Was it beautiful weather? The unique coastline? The occasion? Feel free to share your story so we can all find new vacation ideas for next year’s beach season! Number of winners: Only 1, so enter now! Only one entry per email address will be allowed, so that everyone gets a fair chance of winning. Want more giveaways? Let me know about the kinds of things you would like to win when you enter your comment. You might inspire a future giveaway! Posted on August 25, 2011, in Giveaways. Bookmark the permalink. 6 Comments. BEACH ME! We use to always go to Rohoboth Beach. My aunt had a house there. We played on the beach and walked into town. I have have a lot of happy memories. Beach me! One of my most memorable experiences on a beach was in England on the coast of the North Sea. The beaches there are rocky not sandy. It was beautiful, but the water was freezing. I remember laying on the beach at night and the sky was so clear, I saw the most stars I’ve ever seen in my life. I even saw a satellite float by in orbit. BEACH ME! Southern California, baby. Beach culture! BEACH ME! My favorite beach of all time is Hilton Head, SC. I will build a house there if I ever win the lolttery. The pleasant beach architecture theme as you enter the island, the gloriuos beaches,the beautiful homes, the restaurants, the shopping—it has it all! We were there for our 25th wedding anniversary and decided to para-sail. What an experience!